Lord Cromwell of Tattershall Castle is in need of experienced ‘Eggsplorers’ to help him with a problem from Friday April 3 to Monday April 6. Join in with the castle’s annual Easter Egg Trail, sponsored by Cadbury, by exploring the castle and grounds and spotting the clues to claim your chocolate Egghead at the finish. The trail will take you from the basement to the battlements so all Eggsplorers will need a lot of energy to climb the 149 steps on the spiral staircase. In order to get into the Easter spirit the castle will be holding egg and spoon races, you can get creative with some craft activities and try your hands at some medieval Easter games. All trails are £2 per person. Normal admission applies. 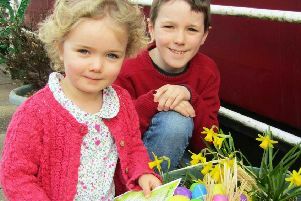 The Easter Egg Trail runs from 11am to 4pm each day over the bank holiday weekend.